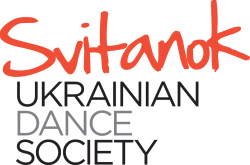 The Svitanok Ukrainian Dance Society is a non-profit charitable tax organization that is dedicated to providing excellence in the training, performance, instruction and promotion of character and Ukrainian dance. In order to continue to maintain operations and advance our progress the Svitanok Society's objectives also include the efficient financial management of the organization. We rely on donations from many organizations and individuals such as yourself. Every donation is gratefully appreciated and will enable us to continue to enrich the lives of our members, our students, our dancers and our community as a whole. Below, view a listing of the Society's donor levels for the 2016-2017 Season (June 4th, 2016 - June 2017. Donor levels are subject to change). 5 Beechwood Avenue, PO Box 74171, Ottawa, ON, K1M 2H9. Official tax receipts will be provided for all donations exceeding $10.00. Please let us know in whose name you would like the donation to be made or if you wish for your donation to remain anonymous.